Toyota Corolla 2014 has been a hot topic of discussion among car lovers and analysts since the beginning of 2013. As the year comes to an end, a better comparison can be made between the new version and its predecessors. The latest model is definitely something to marvel at with all the tweaks which have been incorporated by the manufacturers. The automobile has always been one of the top family cars. The remodeled version will now be loved even more. 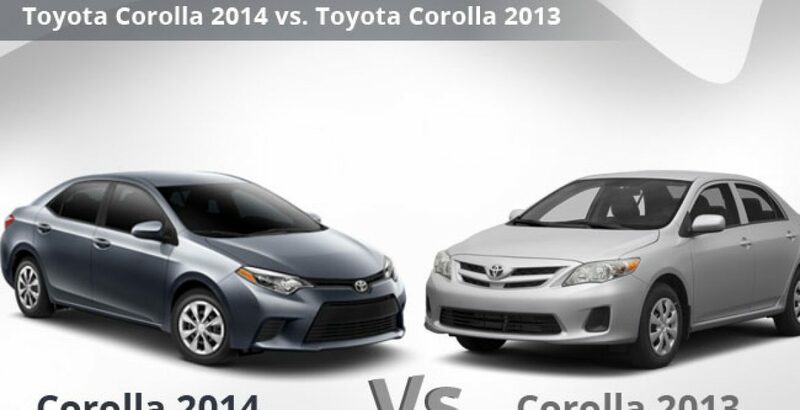 Let’s take a look at how Toyota Corolla 2014 differs from the 2013 model. A Drastic Facelift: The most prominent change in the car is its drastic facelift which has completely transformed the exterior design. It is not a simple sedan anymore. Instead, the vehicle is now hot, chic and sporty. Practicality of the design is now accompanied by extreme dynamism and style. Aggressive Anterior: Call it bold or call it aggressive, the sleek car now looks completely different from its 2013 version. The front has a slim look owing to its sleek headlights with low LED beams. The front grille joining the two headlamps is thin and houses the company’s logo which has been aesthetically placed in the center. The bumper has raised edges which contribute to the car’s aggressive look. Sleek & Compact Exterior: The rear of the car is just as sleek as the front. Multi-faceted tail lights are connected by a thin crease down the middle of the trunk. The back does not extend out to occupy too much space, thereby keeping the car compact. Dramatic Look: A flat and plain window sill has been replaced by rear quarter windows. In addition, character lines and creases created aesthetically in the car’s body add to an overall dramatic look. Spacious Interior: Although the new car is compact, it is bigger than that of the 2013 model. There is more room inside for a really comfortable ride with your family members. The car is 3,845 mm long with a wheelbase which is about 3.93 inches larger than the one in the previous model. Inside the vehicle, you will find a luxurious and roomy interior. There is more leg space, more comfortable seats and more room for your luggage. The safety features of the new model have also been enhanced. The car is not only more comfortable, but also comparatively secure in order to make it qualify as the most perfect family car. Standard, Knee & Seat Cushion Airbags: Along with 8 standard airbags, the driver has more protection in the form of a knee airbag. In addition, the passenger sitting in the front has the protection of a seat cushion airbag. These are new features which were not found in the model of 2013. Five-Star Safety Award: The previous models of the car, starting from the year 2009, have won the title of “Top Safety Pick” in the market. NHTSA (National Highway Traffic Safety Administration) in the US has awarded high rating to the car with the 2013 model receiving four stars. However, the new model is expected to receive 5 stars which is the highest rating awarded by NHTSA for the best safety features. All the previous models of the vehicle have come with immense reliability with respect to the performance and overall quality. In the case of the new model, this reliability has been further enhanced. Different versions of the new model will come with three different types of warranty standards: a 5-year power-train warranty or 60,000 miles; a 3-year standard warranty or 36,000 miles; and a 2-year standard warranty or 25,000 miles. This means, the resale value of the new car will also be high. Apart from looking gorgeous and performing great, the new model also gives you the perks of the latest technology. You can use the Bluetooth technology for easily handling of your phone while you drive the car. Similarly, you can also enjoy the automatic climate control, reversing camera and Entune App suite for Smartphone devices. The availability of the features depends on the model and the market. Overall, the new model is nothing like what you have seen and experienced in 2013. It has been changed dramatically with exciting improvements for both the appearance as well as the performance.